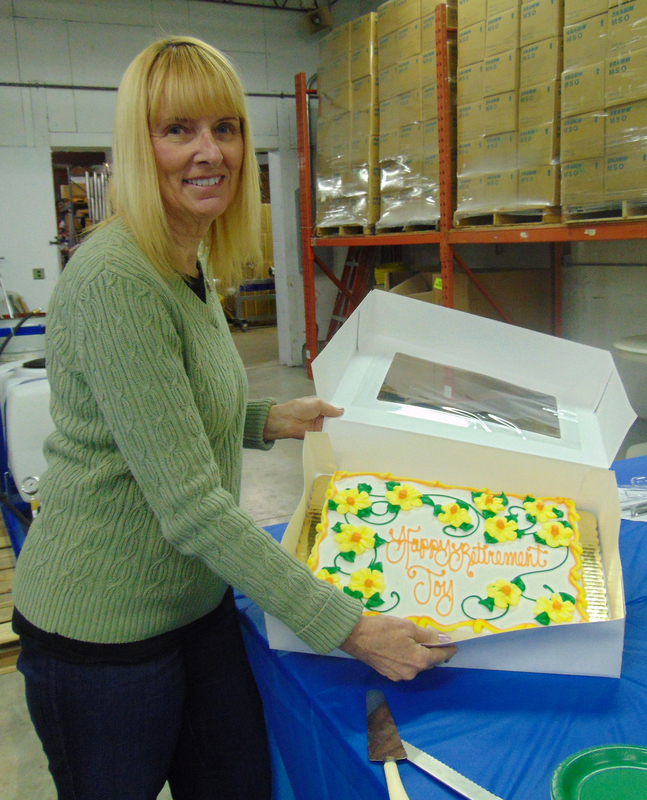 Manitowoc, Wisconsin- After 15 years working devotedly as a Customer Service Representative for the Dramm Corporation, Joy Mleziva is retiring on May 28th, 2014. Since January of 1999, Joy has provided Dramm customers, whether they are a homeowner, Commercial/Retail Distributor, farmer or any other type of smaller business with friendly and timely solutions. Before starting at Dramm, Joy worked in Customer Service, but in an entirely different industry, with a distinctly different product mix. "This was a big challenge for me to change over to Greenhouse products," said Joy. "But I learned a lot from Kurt Dramm and all the employees including Patti VanderHeiden, who works alongside me in Customer Service." Joy has been a Customer Service Representative for the entire 15 years she has been a Dramm employee. "No Company could run without customers who believe in their product and we as Customer Service Representatives are there to make their experiences very pleasant and helpful when they contact us," said Joy. "I never had a policy. I have just tried to do my very best each and every day." "Joy is a wonderful member of the Dramm Team, offering a great combination of teamwork and laughter," said CEO and CFO Hans Dramm. "I also know she had a great rapport with our customers, so she will be sorely missed from both sides of the Dramm door. We wish her all the best in her retirement and hope she will visit often." "I will miss everyone and I want to thank all past and present Dramm employees for being there when I needed help and to Kurt Dramm for giving a middle-aged lady a chance to work for such a wonderful company," said Joy. "This is never good-bye. I will always be blessed by everyone I have met and talked to in these past 15 years and wish everyone continued happiness in their careers."